Remember S.E. Hinton’s novel The Outsiders? It was my favorite book when I was a teenager. I could not get enough of those Greasers. They were the perfect heroes for the marginalized teenagers, and let’s face it. All teenagers related to the Greasers, because inside, we all felt marginalized. And when I saw The Outsiders movie? It was radical. Seeing my fictional crushes morphed into real people (Ralph, Rob, Matt, and C. Thomas!!!) made me light-headed. They were so cute, tough, and cool. It was awesome. Whether it was the book or the movie, I loved The Outsiders so much it was all I could talk about at times, only I was limited to word of mouth, as in my real mouth, and writing with a pen, I love Ponyboy, I love Johnny, and I love Sodapop on my notebooks. Actually, most of my adoration stayed in my head because in the eighties we didn’t have the same outlets kids have today, and most of my friends preferred other types of reading. My friend Angie and I shared our obsession by watching The Outsiders on disk. I’m not talking about a DVD kids, if you’re reading this. These disks were brand new technology, and very big, like a vinyl record in a case. Hard to explain, but you can Google it. Fast forward to the year 2016. Here’s some The Outsiders trivia for you. What’s so special about the shoes in this picture? If you’re over eighteen, you might not remember. I didn’t either, which shows that my daughter is a better fan than I ever was. She got these shoes from her dad for Christmas. She asked for them specifically because they were the shoes that Ponyboy Curtis wore in the movie, The Outsiders, and also because she just likes them and would wear them anyway. And also because she’s much cooler than I was at her age. I am so jealous that I didn’t think of wearing Ponyboy’s shoes when I was a kid…No, wait. I DID have a pair, but I wouldn’t wear them. 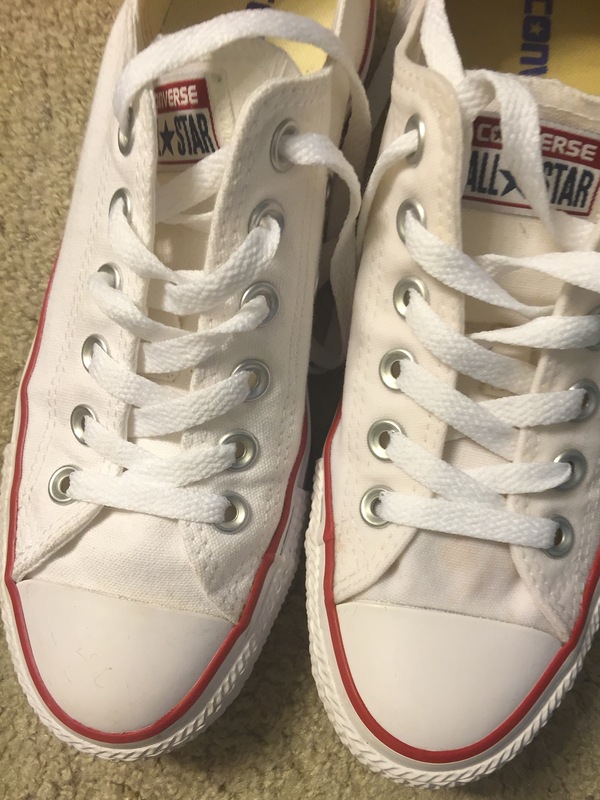 My shoes were the high top ones, white and red just like my daughter’s, but I hated them. I know, I know. I am a terrible The Outsiders fan, but back then, those shoes were so five or ten years ago. I couldn’t even believe my mom bought me shoes that kids wore in the sixties and seventies! Gag me with a spoon. Not once did I stop and think about Ponyboy wearing canvas Converse shoes, or maybe I would have gotten together with other The Outsiders groupies and we would’ve worn them all on the same day. Nah, probably not. Like I said, I wasn’t that cool. I looked like a Prep on the outside. I was a total Greaser in my heart, but I couldn’t have gotten away with wearing those shoes. It was KEDS all the way for me. Anyway, my daughter, the better fan, couldn’t wait to wear these awesome shoes right after Christmas, because she’s so cool she can sport a letter jacket, a 4.0, and Greaser shoes like nobody’s business. And no, she didn’t even need to call her friends up before she wore them. Wearing them on her own was enough. I don’t know if this story is interesting to anyone else, but what I love so much about watching her fangirl over The Outsiders is that we have this part of our youth to share. The only difference is that it is a lot more fun to be a groupie of The Outsiders in 2016, thanks to social media. Stay Gold is even a thing now. It’s a meme, so much so that my daughter and I both get very annoyed when it’s quoted on the internet by people who have obviously never read the book, or at least seen the movie. It only takes a quick scroll down their Instagram or Twitter feed, or a look at their Pinterest boards, to find this out. Social media and an array of products to show love for The Outsiders seem to have given it a new life in this generation, but the most ironic part of this whole story to me is how the story itself is still delivered. It’s a novel, one of those old-fashioned things that was around a long time before Instagram. That’s how I discovered it, and it’s how my daughter discovered it too. I think it’s fun seeing how my daughter enjoys paying tribute to The Outsiders by wearing her Converse shoes, watching the movie clips online, following S.E. Hinton on Twitter, owning the movie version on DVD, but when she reads The Outsiders over and over, guess how she’s reads it? She might have a Pinterest board dedicated to The Outsiders, but when it comes to the novel, she doesn’t go for a digital version. She won’t touch my Kindle. She reads only her paperback copy. At risk of taking S.E. Hinton’s words out of context, all I can say about my daughter is that she’s golden. I guess the point of this story, besides strolling down memory lane, is that if you have a teenager in your life who hasn’t read The Outsiders, you need to give them a copy. Now, go follow S.E. Hinton on Twitter, and stay gold, y’all. Previous Waking Up Joy is Only 99 Cents for a Short Time! Well, I had a good teacher. Hugs.